LARP (Live Action Role Playing) Hybrid Polyurethane and Latex LARP Gear - Armour - Shields - Swords - Daggers and More. Gear for ConQuest, one of Europe’s largest LARP games. Our Collection of Forgotten Dreams LARP foam arms are replicas of weapons from ancient eras through Medieval and Renaissance periods. 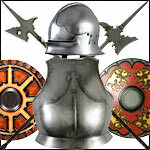 We also carry a wide selection of LARP Fantasy Arms and Shields. In LARP Accessories you will find everything you need to put the finishing touches on your costume. From leather pouches to scabbards and frogs for your LARP swords!! LARP Armor and Helmets from Hybrid Polyurethane for Live Role Play, Stage and Screen and Medieval Re-enactments! High Quality Arm Bracers for LARP events Ren Fairs and Re-enactments. Perfect for any LARP Role playing. We provide all your needs for any costumes for any Medieval or Renaissance Faire. Come in and join the fun. We have LARP Fantasy Armor for any Larp role playing you have in mind. Our selection of LARP Foam Weapons are among the best on the market and are acknowledged around the world. Known for their safety, our larp weapons are light weight, flexible and able to withstand solid blows. LARP Shields - Shields made from very Tough, yet Lightweight Hybrid Polyurethane. Latex Foam Arms, for Live Roleplay. Our LARP medieval swords, daggers, shields and arms have been constructed to last! Elevate your game to the next level with our expertly made foam latex swords from Palnatoke. Safe, Durable and Stylish LARP Swords! Our Warlords line of latex weapons have a realistic look and finish and are some of the finest on the market. A hard rubber handle and real suede wrapping ensures both great balance and a firm grip for complete control.